Hotel Reservation: How to Count Room Numbers with Respect to Their Types? I am working on hotel reservation form of upt to 8 rooms and each room can choose from different fares of 4 different hotels. I am uisng the inventory widget to check availability of the 4 hotels, but haven´t stablished a way to limit too when choosing within each room. I thought I could make a calculation where it would count for example if any of the rooms (1 to 8) had fares from A to F (hotel 1) and that total send it to the invenory widget and show a message if there was no availability and the samme for each hotel , but have´t figure out how to use the count formula, could you help me out of the formula or any suggestions on any other way to solve this? As far as I understand from your question, you want to enhance the inventory widgets functionality and combine the room availabilities with room types as well. With additional "Inventory" Widget you can achieve similar scenario. 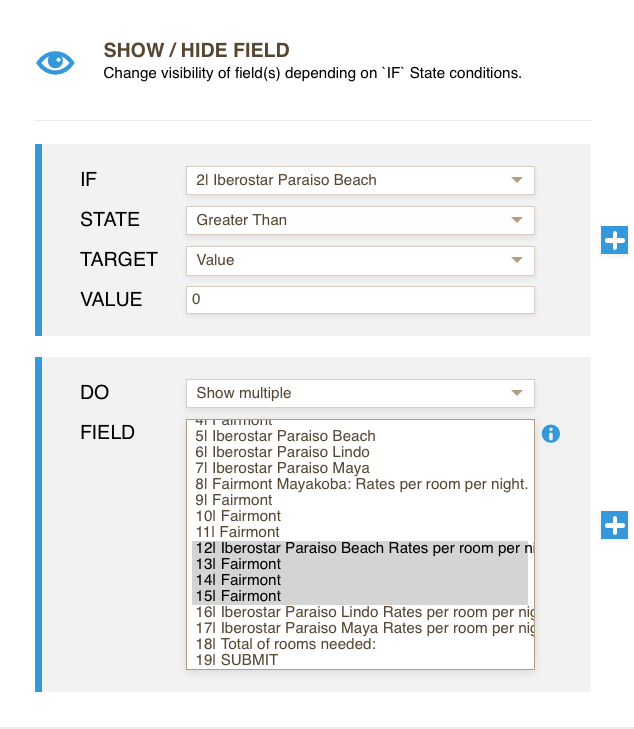 For each room type create one "Inventory" Widget, then split the total available room number for every one of them. For instance, you have 60 rooms "Fairmont Mayakoba", set 60 free for it like you have already done, then set 30 for "Fairmont Double" room, 20 for "Fairmont Single" room and 10 for "Fairmont Deluxe"; but the total free room number has no relation with the room types' availability, so you need to set them individually. I hope this method will work for you. Please, don't hesitate to contact us, if you need any extra help.